Looking for Earth Science worksheets? 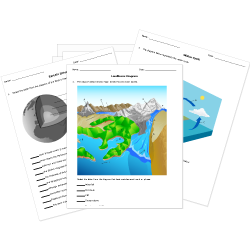 Check out our pre-made Earth Science worksheets! You can create printable tests and worksheets from these College Atmosphere questions! Select one or more questions using the checkboxes above each question. Then click the add selected questions to a test button before moving to another page. keeps Earth from spinning too fast. is caused by the Moon. results in ice and dark at the poles in winter. keeps the wind circulating at constant speed around the planet. is caused by Earth's rotational forces. Air near Earth's surface tends to be which of the following? What is the correct order of atmospheric layers? What do isobars on a map tell us? Which of the following is not a function of the atmosphere? The Great Oxidation Event took place approximately how many years ago? Near the equator, the patterns of convection currents are called . These winds blow from subtropical highs toward the low pressure. Cyclonic patterns rotate around of center of atmospheric pressure. The troposphere has low air pressure for around 30 km, has a prominent ozone layer, and gets colder with altitude. Isobars can cross one another. Updrafts and downdrafts are examples of scale air movements. By how many degrees does temperature drop per 1000 m or per 1000 ft ?